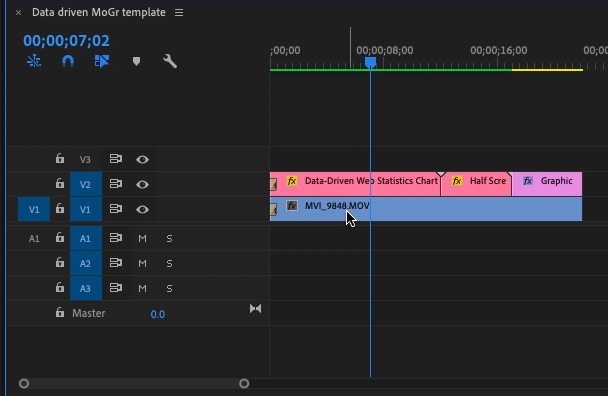 In this tutorial I’ll do a walkthrough of three of the new features found in Premiere Pro CC 2019. These are updates that were just made available late in the year 2018, and before you know it will be at NAB, and that means there will be new updates again. But there are a couple of things that really stood out to me from the 2019 updates that I would like to highlight. I also want to put them through their paces, because a lot of times the corporate hype doesn't always match reality. So, let's take a look at three of these key new features. First up is data-driven motion graphics. 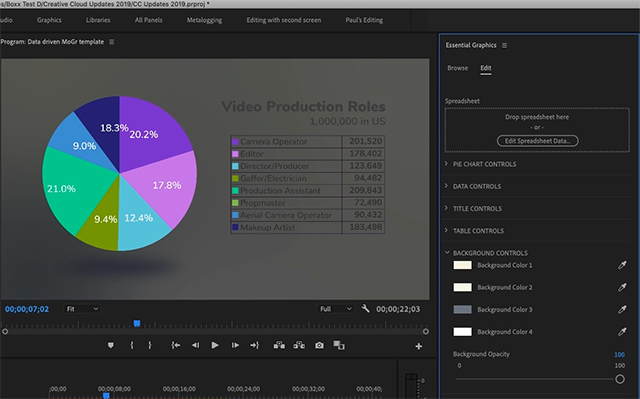 This is one of the biggest game-changers for motion graphics. If anyone has ever been tasked with creating a motion info graphic, you know how tedious and difficult it can be, because you're basically animating everything by hand, but you need it to look statistically correct. 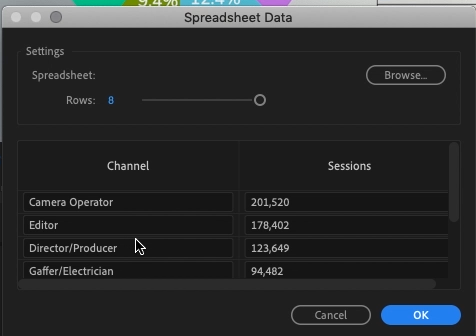 With this new capability in Premiere Pro, those days could be behind you. To demo this feature I downloaded a free motion graphics template from Adobe Stock. 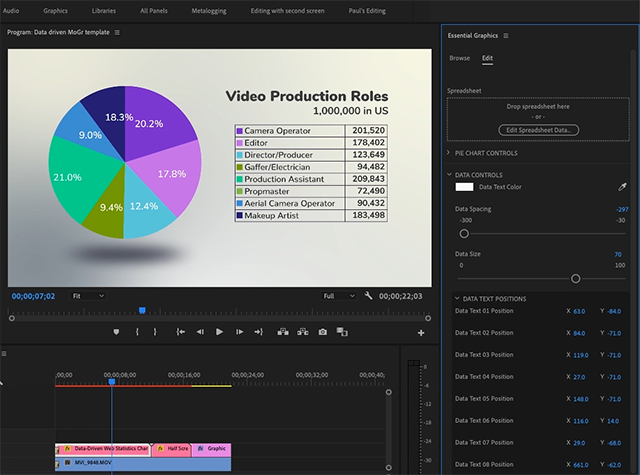 Figure 1 (below) shows what the template looks like after the animation is completed on-screen. At the 1:06 mark in the video you can see what it looks like as it animates. Figure 2 (below) shows my timeline in this project. You can see I have a second layer: a B-roll clip that I have from another project, overlaid with the graphic. Now let's dive into the controls you have for it. First, I'm going to change the opacity back up to 100% so you can see what it looks like by default (Figure 3, below). There are innumerable ways to customize this graphic, but the most important thing here is the data. 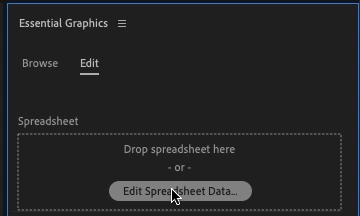 At the very top when you have a data-driven motion graphic template, you have the button shown in Figure 4 (below) to edit the spreadsheet data. Figure 4. Click this button to edit the spreadsheet data. When you click that button, the Edit Spreadsheet Data dialog box (Figure 5, below). Here you can actually edit the content that came from the CSV file, that pulls the information in. For this project, I just went in and made up my own statistics. These are not necessarily accurate, but I created my own spreadsheet and adjusted the information in the dialog box. Now, if you want to do it in Premiere Pro, you can. But if it's a massive data change, you probably want to go into an application like Apple Numbers of Microsoft Excel to make those changes. But if your changes are light (or you’re just making up numbers like me), I can even adjust how many rows are displayed on the screen, and it will adjust everything on the fly. 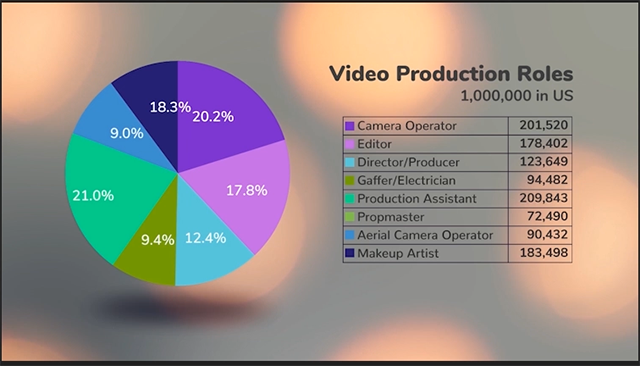 All the content you see in Figure 1 for the names and numbers is customizable, the colors can be changed, and they will correspond to what’s on the pie chart. The numbers, of course, are in the spreadsheet data, but you can change the border around the numbers, the color of the text, the title, and the number in the subtitle is calculated automatically. And then the data right here at the end of it is dynamic, and can be change by hand. Now you'll notice we have one little issue since I changed the data. The 18.3% in the pie chart in Figure 6 (below) is a little bit off. That's very easy to fix. Under data controls, you'll find data text positions. And then each one of these corresponds to its number from top to bottom. So, I know that make-up artist is the dark blue. That one needs to be adjusted a little bit. So, I'll just slide it over until it gets into a position I like better. And I might even slide it up some. And there we go. Easy fix. Now, there are many templates to work with from Adobe Stock that are very easy to work with. There are free ones and then of course there are paid ones. But you can create them yourself in After Effects. But unless you’re an After Effects master, I suggest you start with a template, because it's much simpler.